A text item displays one or more lines of text on a graphic page. To add a Text Item to a graphic page use the Add Text Tool. Text item properties define how text appears on the graphic page. For example, the FontFamily property sets which font face is used to display the text. When one or more text items are selected, the text item properties are shown in the Properties Window. To make changes just enter new values for the appropriate property. Text The text to display (unless overridden by the DataBindText property). To enter multiple lines of text, Click the Browse button to open a multiple line text editor. FontFamily The font family used to display the text. To change the available font families use the Global Text Styles Editor. FontSize The size of the text in points. TextColor Defines the color of the text (unless overridden by the DataBindTextColor property). TextStrikeout Specifies whether the text is drawn with a strikeout effect (unless overridden by the DataBindTextStrikeout property). TextUnderline Specifies whether the text is drawn with an underline (unless overridden by the DataBindTextUnderline property). Direction Defines the direction of text (horizontal, vertical up, vertical down). HorizontalAlignment Defines the horizontal alignment of text in the bounding rectangle (left, center, right). 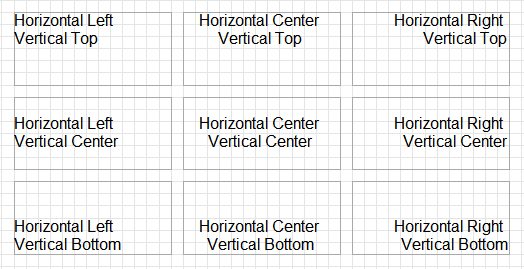 VerticalAlignment Defines the vertical alignment of text in the bounding rectangle (top, center, bottom). BlinkMode Defines how the text item blinks: Invisible or Alternate Color. BlinkSpeed Defines how fast the text item blinks: Slow, Medium or Fast. BlinkTextColor The alternate text color when the blink mode is Alternate Color. DataBindScaleX A Data Binding which resizes the image in the horizontal direction. A value less than 1.0 shrinks the item horizontally. A value greater than 1.0 expands the item horizontally. Note: This property has very little effect on text items because font is chosen to fit the available height. The aspect ratio of the characters in the font is always preserved. DataBindLineColor A Data Binding which specifies the text to display. DataBindTextColor A Data Binding which determines the text color. DataBindTextStrikeout A Data Binding which if evaluated to TRUE draws the text with a strikeout line. DataBindTextUnderline A Data Binding which if evaluated to TRUE draws an underline. The FontSize property defines the height of text in points. A point is traditionally 1/72 of an inch or 0.3528 millimetres. The drawing canvas is notionally an A4 page in landscape orientation (297 x 210 millimetres). The height of the text drawn is chosen by scaling the point size relative to the notional A4 size of the drawing canvas. In typography an em is a unit of measurement equal to the current point size. For example in a 24 point font, the size of an em will be 24 points or 8.4672 millimetres. An em is the same size in all font faces. Font designers layout fonts relative to an em square, but are not constrained by its dimensions. A font designer could design font glyphs that are substantially smaller than the em square, or stray outside its boundaries. This is why two characters from different type faces can have different sizes even though they are using the same point size. There are hard breaks (for example carriage return) in the text. The text is wider than the bounding rectangle and there are break opportunities in the text. A text line is wider than the bounding box and there are no line break opportunities in the text line. The number of text lines exceeds the height of the bounding box.